Hehe, that's my note. The keyboard will smell for a while as the oil paint cures. It will go away over time. It was painted less than one week before you got it, hence the smell and the notes I actually love the smell of oil paint personally. Thank you Maybe you could keep the post-its on it! Also, what have you got against that pen It's a nice brown marker pen--I actually use it for work to take notes, as it has such low friction. So I'm contemplating on working on Jailhouse Blues of my own. I have 45g springs on the way to try out, instead of cutting stock blue springs. The click should still remain greatly diminished, right? I'm not a fan of the thunderous (exaggerating!) click of stock Blues, but I Love the faint soft click of Jailhouse Blues on this keyboard, and I'd love to achieve similar results. Just with lighter springs. How loud the click sounds depends on how tight the spacer fits between the two pieces of the stem. The click comes from the white part snapping downward after it's forced over the bump. If the spacer is tight and removes all the travel between the two pieces, there will be no click. If there is a little room for the white piece to move up and down the blue piece, you will get a faint click. The more wiggle room you leave, the more the actuation point moves closer to stock and the original floaty feeling of blues comes back. So I guess it would be possible to put half height spacers and get semi-jailhouse blues! Oh no I like the ones I tested. I want the same but lighter spring. I'll have to look at your photos of the cut-up card pieces closely and try to go from there. The white part shouldn't smack the bottom of the switch much if at all, so noise from it should be minimal at most so long as you fill up the space as much as you can. I think it's not so much about how loud it is, but more about consistency between all the switches. Even a tiny bit of looseness in the spacer can make the difference between no sound and a faint click sound. Many people along the tour have already noticed more clicking in a several keys than the rest. There's a very fine line between too thin and too thick when cutting the spacers by hand. I went back and re-cut spacers for the ones I thought clicked too much when the board came back to me for repairs. I know many of us here would go crazy with even with one key not clicking exactly like the rest haha. I think it's not so much about how loud it is, but more about consistency between all the switches. Even a tiny bit of looseness in the spacer can make the difference between no sound and a faint click sound. Many people along the tour have already noticed more clicking in a several keys than the rest. There's a very fine line between too thin and too thick when cutting the spacers by hand. I used wire, so I never had that issue, but I can see how it could be. It still should be minimal compared to the click of a normal blue switch. This is just a heads up post that the board was hand delivered to me (No USPS, Yay!) & is now in my possession. The following are some quick (poor) pictures to show that I now have the keyboard & its condition, I look forward to giving it a try! You have two options, thinner wire, or try Clears. But I'll play with the Blues to see what feels / sounds good. Does thinner wire makes the click fainter and restricts the movement less? I.e. can you get a degree of "Jailhouse Blueness" by varying wire gauge / height of the blocking pieces? Yes, thinner wire allows some movement and raises the actuation point back towards normal. If you find the right gauge, it may be possible to put a wire on top and below, but I wouldn't count on that as it could cause problems with the spring. While printing would make this work, 3d printed parts at this thickness would likely not have enough strength. A better option for mid level may be to use epoxy, just be extremely careful. ...I know many of us here would go crazy with even with one key not clicking exactly like the rest haha. A cheeky little modification to the QFR box. I’m not sure if it was by coincidence or by planning, but both khaangaaroo and Leslieann both came up with this mod in a three month span. At first I was a little worried that this would be a custom mod that I could never try unless I met these two GHers. I’m always trying to get my hands on new switches and boards. Luckily this tour allowed me to try these switches out so this was a really cool experience. Just as a reference, I don’t like MX Browns and love MX Blues. Keep that in mind as you read this; I am definitely biased. The board is a modded QFR. Since everyone and their mom has posted a billion reviews/pictures/threads/videos/soundbytes/mods on the QFR, I think it’s safe to say I don’t need to write a full review on it. I will say that that rubber coating on QFRs was a real turn off for me but this case top that Photoelectric sprayed up was lovely. The only issue with this Jailhouse Blue QFR is that it REEKED for two days. It was so powerful on my first day of testing it that I had to put it away after a few hours of use. But by the end of my testing time, it didn’t smell and I appreciated the lovely gold-ish metallic color. And for what it’s worth, khaangaroo did a great job fixing the board after mashby had it. The board did not cause my computer to reboot at all. The very first thing I noticed when I started typing was that the bottom out was so shallow compared to what I’m used to. It seemed like it was even shallower than 50A-R o-rings. Bottoming out felt sudden; it wasn’t like the bottom out on a Chiclet or scissors but it still was too quick for me. I’m very used to the standard MX stroke when I type and the sudden change confused me. I had the same issue when I was typing with o-rings; they felt nice but the change in travel distance was too much for me. Quickly after this first realization, I figured out that this was the quietest mechanical keyboard I’ve ever typed on. Even the HHKB I tried wasn’t this quiet. The Matias quiet switches were pretty close but if your primary concern is the sound of your board, you might want to consider this mod/switch. Actuation force on the switches was very nice since the switches are MX Blues after all. Like I said I’m super biased and those are my favorite switches. But if I had to compare them to an MX switch, I would say that they felt like Browns. These switches were everything Browns should be besides being short throw. My notes say that they feel like sharper, bumpier Browns. In a better explanation, when you press down, there’s the initial engagement that Blues have. It’s a sharp little ramp. But instead of a click at actuation, the Jailhouse Blues have lovely tactile bump that is what I’d call a medium tactile bump. The Browns have a light tactile bump, Jailhouse Blues a medium, and Clears a heavy bump. They don’t depress into a click, but instead, feels solid and then have the bump, quickly followed by a bottom out. The travel is maybe half of the MX travel; like I said before, it felt like o-rings were installed in the board. The other thing I noticed that bothered me is that some of the mods felt sticky. Kind of like how they were ergo-clears with springs that were too weak. They’d just feel gummy and didn’t rebound all the way like my boards do. I’m not sure if that’s because of the mods or if it’s just how the switch is. Also I don’t like thin PBT caps at all. They reminded me of the WASD thin ABS caps which I didn’t like at all. If I tried this switch instead of MX Browns at first, I would’ve loved these and their tactile bump. However, the short-throw throws me off and I couldn’t get used to them. I won’t be making any of these switches. But, it was amazing to get to try a custom mdoded switch like this. Thanks for making this board khaangaroo. And thank you for putting the board on tour! And shoutouts to LeslieAnn who seems to be helping to refine this switch/mod. Eek sorry. It's because it was freshly painted and still curing, and being in a tightly-closed box all packaged up for a few days during travel probably didn't help. When I packaged it, it barely smelled, but sitting in a box probably did it. My Ducky was painted just under a month ago, and I can't smell anything anymore, even when I stick my nose directly to the case. Nice review though, I felt the same way. Except when equating them to Browns--they are MUCH snappier and tougher than Browns. Having typed on Blues for the past week, going back to Browns was a bit weird, and I do feel the similarity a bit more now, but still. Thanks for the review dude. It was actually by coincidence that Leslieann and I modded our blues at the same time. If I had seen her post first, I probably would have tried the wire method and never bothered with cutting spacers out of credit cards. Sorry you had to be the first to receive the board after the paint job I painted the plate on my 87u and lock it in my desk at work overnight. For the first couple of weeks, it would smell whenever I pulled it out of the drawer the next day. Being in an enclosed box definitely infuses the fumes...haha. It's not for everyone, as you found, it's quite a different switch from most others. I honestly think some of the sluggishness is the method used, if it's sluggish with stock/uncut springs, something is rubbing. Mine have cut down springs so they have the same actuation pressure as normal blues, and they are quite snappy, not a sluggish one in the bunch, but I spent quite a bit of time to accomplish it. If the spacers are cut too thick, once they're wedged in there, they can make the white piece bow outwards and rub against the side of the switch housing. It has nothing to do with springs being uncut. It's just me making spacers in a hurry and not caring if they're all perfect. I didn't mean the uncut springs were causing it, I said if it's sluggish with uncut springs, it means something is definitely rubbing, which you just confirmed. If mine rubs at all, my keys will stick because the springs are so lightweight. I didn't notice any sluggishness when using the keyboard. Sorry, I misread your comment. I got carried away when I thought you trying to be judgmental of the method I used and condescending of the little time I spent putting the board together. Sorry to everyone along the tour that noticed slightly clicky keys or slighly sluggish modifiers. That's all the fault of my workmanship. I shouldn't have started a tour with a board that was so far from Leslieann's intention of what Jailhouse Blues should be. It's her baby, not mine. I was originally gonna sell the board, but got peer pressured into starting a tour. I don't know that there's any need to apologize. Building the board and putting it out on tour is a huge gift to the community, which I am grateful I was able to participate. Granted, I haven't posted my review yet, but having an opportunity to try such a unique switch was amazing and I'm very appreciate of all the work that went into creating it. The creative process is messy and that's to be expected. You guys are creating a whole new switching mod and there are bound to be little issues here, or there. Those of us fortunate enough to be on the tour are the beneficiaries of your hard work and I for one have been inspired to try this on a board of my own. So, I guess what I'm trying to say is... thank you. Any modification that results in something people like is a good modification. I liked this board enough to want a version of my own with lighter springs. It wasn't an immediate love, just like most MX Switches, which took me a good week or two to type on to really get a good feel and begin to like them. So I got 45g springs in place of the stock springs (I don't want to cut the stock springs for a few reasons). It's entirely possible that there are multiple versions of Jailhouse Blues that feel different from each other. We'd have to do another tour for those other modified keyboards to compare. I'd give this one a spiffy name to reflect its use of plastic shims. I would prefer to use plastic myself for the reason of having similar hardness and composition materials locked together and possibly not causing as much stress to each other over time when compressed. Also it would allow for lubrication [and general exposure to the elements] without any worry that it would oxidize whatever metal I choose for wire spacers (unless they are stainless steel... which would be super tough to work with) over the next few years and introduce any potential problems. Which is why I've been looking at zip ties and other similar possibilities. P.S. : I'd just like to add that I loved the extremely faint "echo" of a click when typing on this keyboard. That's what I wish stock Blues were like. EDIT: Also, my last post was meant to be tongue-in-cheek. I guess it came across as more sad and butthurt...haha. That sounds pretty sweet! I want to succeed just for that name! No, every method takes time. Sadly, more time than most realize to really nail down, I went through several ideas and revisions before I got it right. I probably disassembled each switch 5 times before I finally got them on my Filco and was happy. Frankly, I'm glad to see another method and people taking an interest. I wasn't trying to be judgmental (sorry! ), I was just trying to explain some of the things people were experiencing. I think it's really awesome you did this. Based on CPTBadAss' review, can someone compare these to Cherry ML switches? Cherry MLs have a shorter throw and are very crunchy/have a lot of friction. If you hit them off-center, they kinda grind. But they don't feel bad if you hit them dead on. They're very tactile, but different from a Brown/Clear/Jailhouse Blue bump. The travel on them reminded me of scissor switches. The travel on the Jailhouse Blues was half of the normal MX actuation distances imo. I owned a G84-4100 for a while. That wasn't the kind of reply I expected, but thanks anyway. ML feel like compressed MX Brown with tactility (and resistance to bottoming out) closer to MX Clear in my experience. 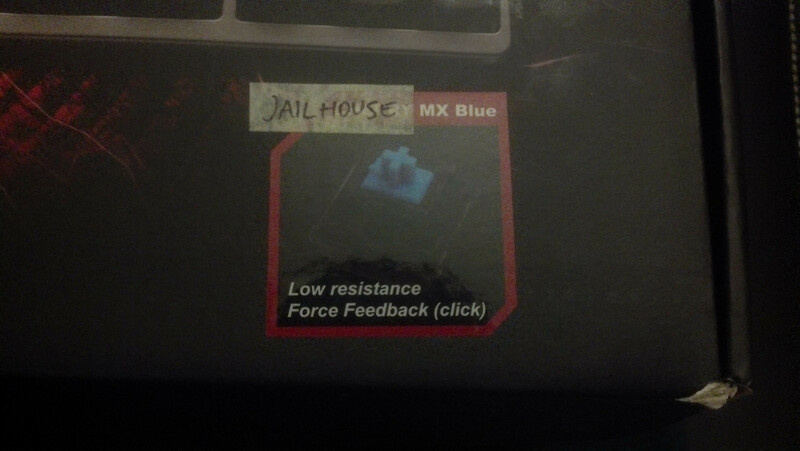 I'm basically asking, whether jailhouse blues maintain the MX Blue kind of tactility. No, they have MUCH stronger tactility. At least this version with compressed springs. These are more like Clears rather than Browns, but with a much faster bump than Clears. The actuation is close to the top--closer than ML based on what you wrote. More like rubber domes in that the bump is near the top and the travel distance is rather short... it's hard to explain, but the parallel with rubber domes stops there--they are still clearly mechanical switches. I'll be playing with making my own version similar to this in the next week, with 45g springs, so we'll see what they are like then. Well I know where my ML board is so I can get it back and give you a proper answer/review if you want davkol. It's been a long time since I've typed on ML switches. I might be mistaken or have mis-remembered. They feel more tactile (Tactile Bump) than Blues and Browns to me. Clears and MLs (IMHO) have that "barrier" after the bump that prevents me from bottoming out, while blues are quite the opposite. If I understand correctly, jailhouse blues are easy to bottom out as well, aren't they? Yes they are difficult to not bottom out when springs are at higher tension as in this method. You overcome the bump, which is close to the top and requires a non-trivial amount of force, and then the travel distance is so short, you're almost guaranteed to bottom out. OK, thanks. I guess I can imagine that—more or less. Probably not what I'm looking for. It's not a bad thing necessarily. They are still not that loud, and you can insert thin o-rings, if that's a concern. For me, it's a deal-breaker. I'm not a fan of short throw, and hard bottoming out makes me a bit worried. It's not hard at all. It feels cushiony. For this particular version, springs are at pretty high tension. I bottom out only lightly on linear switches (MX Red) or not at all on switches with steeper force/travel curve (MY/ML/MX Clear), but common tactile switches get smashed (ALPS, MX Blue, buckling spring). 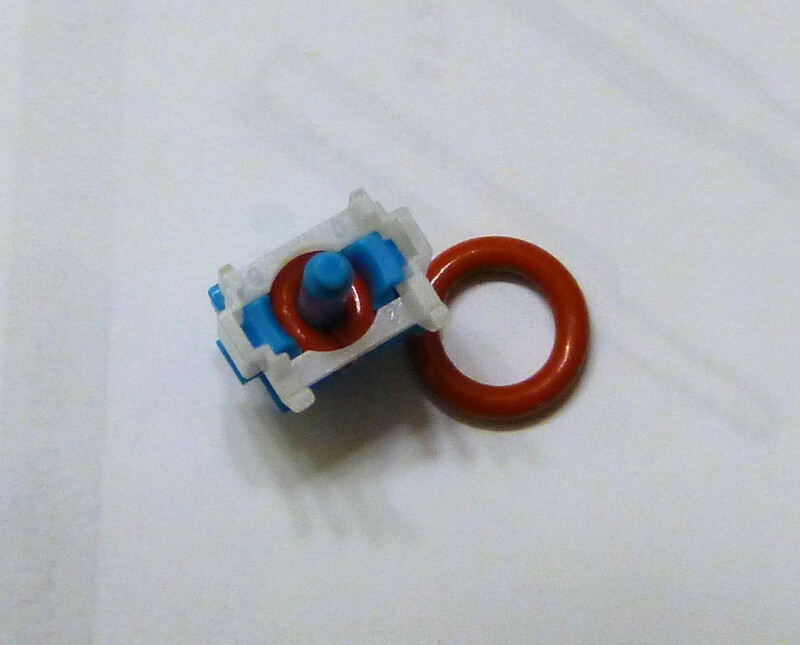 Long story short, I'm looking for MX Clear switches with lighter springs that maintain the number of coils from stock clears. However, this is getting off-topic here. To commence my experiment with zip ties, I got some tiny cable ties from Mouser to play with along with a couple of brand new MX Blues (not touching my Filco with Blues yet). The cable ties are definitely a good option, but they do require cutting lengthwise to be even narrower, so there's some lack of precision. The good part is that you can slide the cut strips until you get to the right width and then snip the right length there. I also substituted 45g springs in place of stock springs (but tried both) and lubed with Krytox. So far, I get zero click (both switches are clicky at stock, I've checked). They feel kind of like short travel Browns with a more noticeable bump. Not very accurate, but I tried some nickels, and both switches (mounted on a block of wood--thanks khaangaaroo for the idea) actuate at 55-56g. That is, if I put 11 nickels on them, they immediately flop down. With 10, they barely budge. So that's around how much is needed to overcome the bump and do travel down in a quick stroke. I have been trying them with thin doubleshot Wyse caps and Ducky Shine caps, and I think I prefer them with softer Shine caps. I love the jailhouse blues but this cutting of O-rings like bagels and trying to rip the incredibly tough and strong plastic of cable ties lengthwise is just too much. First, the work and precise tedium of the cuts, besides the fact that the materials are so leathery and resistant to cutting, by their nature. Would something like this be usable, or does it have to crimp around to stay in place? Hah, just tried much thinner cuts for a loose fit to get some click back. Feels REALLY good but wow, the loud click is back. Which is a no go, because of the noise. They feel sort of like what I imagined Greens would feel. 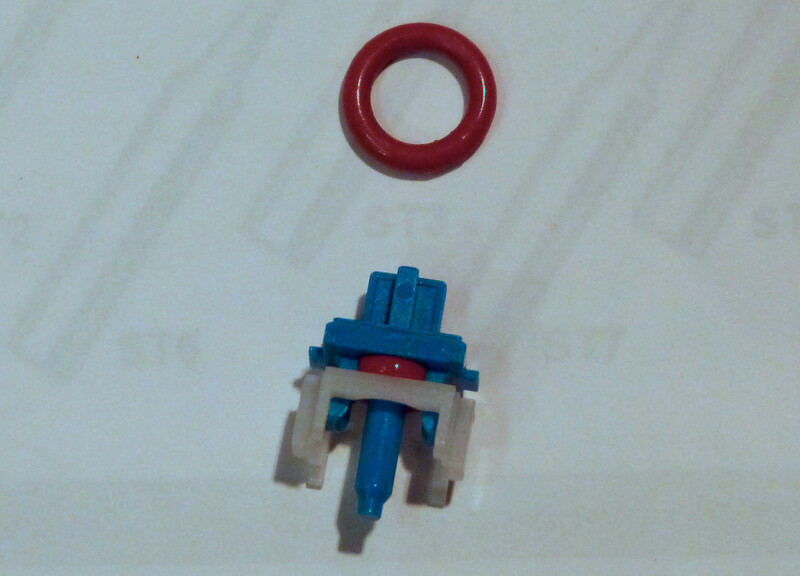 Ok, so can't go too tight or the white part deforms and the switches begin to stick. Just tight enough is okay. But I like it most when the zip tie cut is narrow enough to go in with relative ease but still fill up the vertical space between the white part and the blue part. That results in no click. I'm trying to achieve *some* click, but so far unsuccessfully, save for getting significant click if I go too thin. There's a faint hint of a click when the zip tie pieces fit perfectly and slightly loosely. I'll probably go with that. OKAY! Just found my ultimate method: IMSTO's skinny silicone o-rings! They are perfect for a snug squishy fit (not snug enough to deform the switch at all--they slide in easily with help of some tiny eyeglass repair flat-head screwdriver). Finally I have a use for these o-rings heh. The feel is pretty similar to zip ties but slightly more cushiony. And I'm pretty sure this is going to be a lot more uniform because of the uniform thickness of the o-rings and the way they are inserted (they naturally curl). This is not exactly fast, by the way. The o-rings, once split, are rather squishy, so you'll have to keep gently pushing and prodding with a screwdriver / something similar to gently place them exactly. oh snaps. I'm gonna have to try this with a wasdkeyboards o-ring when I get home. That looks perfect. Yeah, the o-ringed switch definitely sounds more dampened for bottoming out vs the one with zip ties. These o-rings are thinner than the 50A Amazon o-rings. I don't know if WASD has similar. These are directly from IMSTO. I just tried it, and it works with the thinner red o-rings from wasd. They were a little hard to get into place because they're so soft. And the thicker blue o-rings don't fit. The bottoming out is definitely a lot softer. If you press hard enough, you can squish the wasd o-ring enough to get almost full travel in the key. I'm not sure what hardness the imsto ones are. It would be interesting to see what a full board of these would feel like. They are quite squishy - I'm guessing maybe 40A. I was not getting full travel compressing mine, unless pushing very hard is required. The ringed switch just felt softer, which to me is a bonus with such short travel distance. So to anyone playing with switches, I'd definitely recommend mounting a few into something very sturdy and trying them out with keycaps on. I had my blues mounted on wooden pieces, and wasn't quite sure about them. But now I have an empty Filco plate, and I've put a bunch of different stuff onto it. A few ergo-Clears (62g), normal Clears, vintage Black, and o-ringed Jailhouse Blues. Yep, definitely like the JBs! They are rather unremarkable when trying them separately, but actually mounted onto a plate and typing as if on a normal keyboard, they feel quite nice! Just arrived today! Posted a video on my youtube with a typing test for anyone who wants to hear what it sounds like! I've got a set of blue switches "in the mail" that I was planning to try to jailbreak them somehow. 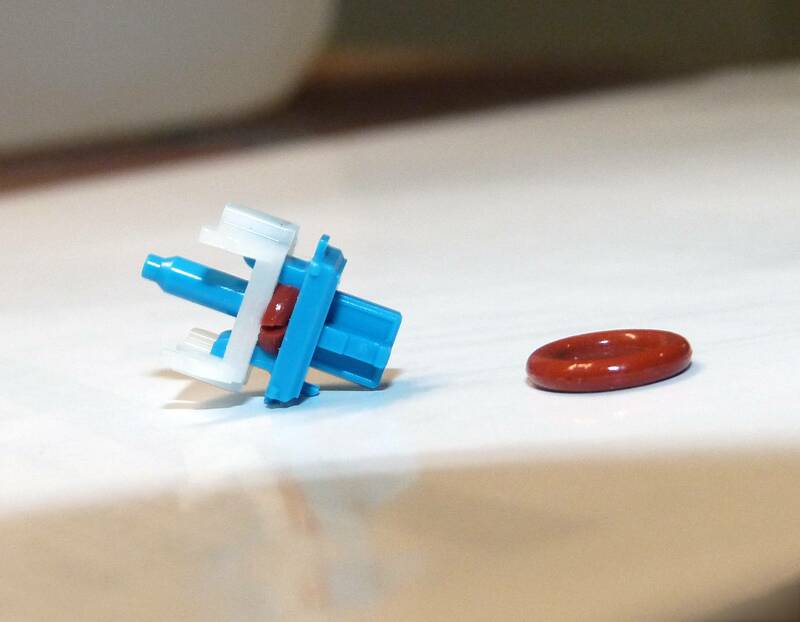 Has anyone tried just gluing the blue and white pieces together while they're fully extended, like with super glue or gorilla glue or something? I would think there is some kind of glue that's strong enough to withstand the ~100g max pressure you'd put on a key switch, and then you wouldn't have to worry about finding something that fits in there perfectly. Having asked that though, the o-ring idea sounds interesting because it would give you some extra curve in the force graph when bottoming out (I have a theory that curvy graphs are usually more pleasant than sharply cornered graphs... same reason a new chewy cookie is better than a day old crackery one).